Every Game I played today of frontlines I have had 3 - 6 inactive players on my team, meaning it is a **** game each time. Honestly EA/Dice, get your act together. How hard can it be to program the game that if the payer has zero points after 60 seconds to send them out of the server. You are ruining your own IP, it is a sad thung to see. Totally agree and inactive players were kicked in previous titles without an issue. What I would say though is that this should be for all game modes rather than just one. You can see that here..
My team put up a good fight on the maps I played, despite being three players down effectively, but that was just delaying the inevitable. @Glaziem I've removed your video as name and shame is not allowed as per the forum rules. This seems to be a constant issue, resulting in handicapped gaming experience. it seems so hard to find an open server when searching to play, and yet there are many times where a team has 1-7 inactive players...seems silly. Yes it is an issue. Every single game usually has several inactive players. It seems to have gotten much worse over the last month. Usually on the losing team, but I have seen it where there were inactive players on both sides. Just the other night playing with my brother, we noticed an inactive account just sitting there, but by the end of the game the player had 2 kills and 52 deaths. How in the **** do you go 2-52? What were they doing the entire match? I agree. Really kills frontlines. Don't understand the purpose, but they are playing with their controls to keep themselves in that server. 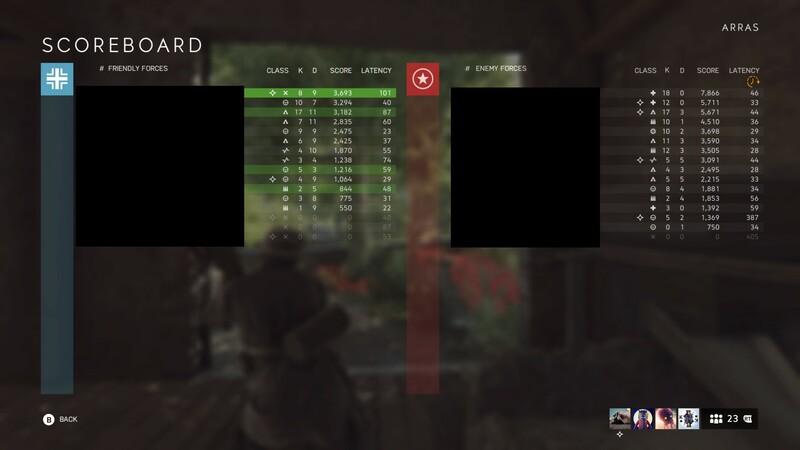 With the latest Tides of War assignment, I've seen multiple people race to get tanks and then sit at the edge of the map contributing nothing while restricting the team's access to tanks. There's nothing to do but troll them with other vehicles, unfortunately. I agree, but who would go and kick these people. Also, where would they get kicked? In the shin? Nah it'd be in the bum. I brought this up earlier, and saw a response from Dice (maybe?) that said this is difficult to ban because the hackers might be using hacked accounts. I was curious, so I kept an eye on BF Tracker at my stats, and noticed I had 20+ hours of use with the STEN when I apparently wasn't playing, much less killing anyone (kill per minute of 0.08). I haven't used the STEN for more than an hour or two since I bought the game. I immediately applied two step authentication on my PS4 account and changed passwords. Hopefully, that will stop the use of my account for that. I believe my account was being used for hacking. Luckily I caught it. Thankfully I didn't get banned. Or it could just be a bug that keeps me logged in when I shut down during an infinite loading screen. I hope it's just a bug. It's frustrating to see inactive players taking up spots during an entire round. Just played a round of Conquest and had a squad member who didn't spawn at all and to make it even worse they were still there at the start of the next match. DICE/EA needs to fix this crap.